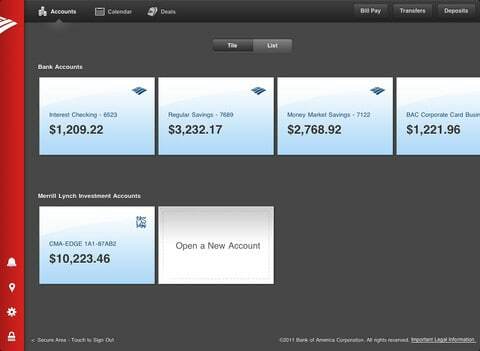 Bank of America iPad App Review. Now, this is a good news for iPad user and Bank of America customers. If you are both of them, the banking giant has now released their mobile banking app which is specially designed for you although it still missing some important features. However, it still has an optimized interface so that you can easily manage any of your account from your iPad. The main overview screen of Bank of America ipad app contains all of your accounts on Bank of America and Merrill Lynch, including your current balance. If you tap on any of it, you will see a new window showing a full detail of your selected account with the options that you can choose from paying bills, view history, and transfer between accounts. This will also help you to manage your finance with an enhanced calendar view. You can see your eBills and schedule any transfers or payments on a future date by a simple tap. You can also find any nearby ATM or banking centers if you tap the tiny location icon which is located on the lower left corner on your iPad screen. Bank of America app for ipad could be downloaded from itunes apps store here.